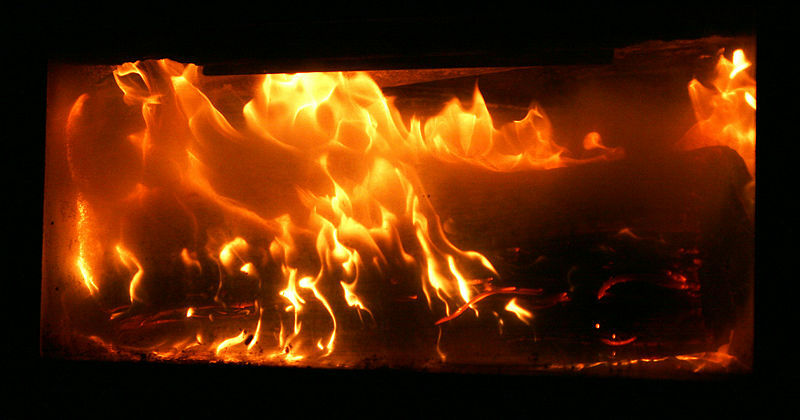 There's nothing quite like the ambiance of a burning fireplace in winter; however even a gas fireplace tends to leave an oily film on the glass doors, which can spoil the look of your crackling flames. You'll be pleased to learn that it's not too difficult to clean gas fireplace glass doors; with a couple of common household cleaners you can have them gleaming in a few minutes. You'll be able to enjoy your fireplace again, with a crystal clear view. Open the gas fireplace doors and place a thick layer of newspapers beneath each door. Spray both sides of each door with orange citrus cleaner, taking care to cover the entire surface. Let stand for 15 minutes. Wipe down the doors, using a damp lint-free cotton cloth and rinsing the cloth often. All of the residue from the gas burning fumes will come off the glass easily. Pour 1/2cup white vinegar into a one gallon bucket; add one quart water. Dip a clean cloth into the vinegar mixture, and wipe down the fireplace glass once more. This will remove any remaining orange cleaner from the gas fireplace glass doors. Polish each side of the doors, using a paper towel in a back-and-forth motion. Check for any spots or streaks you might have missed; go over these areas once more with the vinegar solution and polishing process. Discard the newpapers and paper towels. Your fireplace doors are now ready for use.